Smarketing means aligning your sales and marketing teams for optimum performance. Here we take a look at how this can be achieved, just by putting some simple processes in place. Companies with aligned sales and marketing teams experience higher growth than ones who work in silos, and the first key step in making this happen is to start efficient communication between the two areas. Everyone needs to be made clear exactly who the target market is and what each area’s goals are, both individually and shared. It’s vital that target persona information is shared throughout the business so that everyone is aware who the customer is and if possible, teams should be structured around each persona. Regular meetings must be held for everyone to work together and keep fully up to date on progress. Weekly status meetings are recommended, as well as more detailed, in depth monthly get togethers to address any issues. Marketing must ensure that all their campaigns are supplied to sales and provide a calendar of activity. You will need to define what the hand off process from marketing to sales is so it’s obvious exactly what is owned by each and set up closed loop reporting. This essentially means that sales keep marketing up to date about what is happening with the leads they’re providing. This helps marketing see what of their activity is performing and what is not delivering results. For sales it means leads are deduped, they know where to prioritise and make warmer calls, and for the business, this means better results. MQL (Marketing Qualified Lead) is a contact who has engaged with the team's marketing efforts, but is still not ready to receive a sales call. An example of an MQL is a contact who responded to a specific form in a marketing campaign. 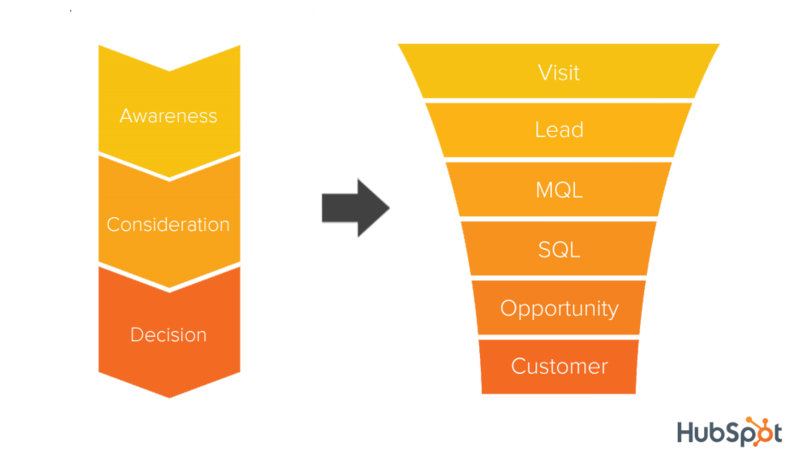 SQL (Sales Qualified Lead) is someone who has indicated through their actions that they are ready for a direct sales follow up. An example of an SQL is a contact who has submitted a question about your product through a contact form. A service level agreement (SLA) will commit each team to performing actions that will support the other and makes it easier to achieve shared goals. Marketing will need to provide sales with the number and quality of leads needed to hit revenue targets and sales will have to agree a speed and means of lead contact that will work most efficiently. Having an SLA in place gives everyone clarity and should begin to reduce unnecessary blame being placed on certain areas if performance isn’t where it should be. The SLA should track progress daily so problems, or indeed success, can be addressed quickly. You will need to create a reporting dashboard with reports that are aligned with all agreed goals. Once up and running, the dashboard will become your bible and you’ll be able to check it daily, reacting to the information it provides you with immediately. The marketing dashboard will show how progress is going to achieving goals and measure volume of leads, their quality and source. Campaign analysis will provide invaluable data for every marketing campaign to clearly show which are driving qualified leads. Sales will be able to track how many and how well leads are being worked by individual reps. A monthly marketing report will do a full breakdown, delving into important metrics. Once this is in place, you will all wonder how you functioned without it. So, that all sounds fairly easy, right?! Of course, there might be little hiccups along the way but working together as one team will soon begin to deliver results that will spur you on to collaborate as much as possible and relationships will improve. If things do go awry, just remember to rely on your data. There’s no need for finger pointing and high emotions when you have facts and figures at your disposal. Try and be mindful that you are all working towards the same objective and you will soon be operating in harmony. Here at Secret Source we’ve worked with many organisations on reshaping their operations for maximum ROI. To have a chat about what we could do to help your business, leave your details below and we’ll be in touch.